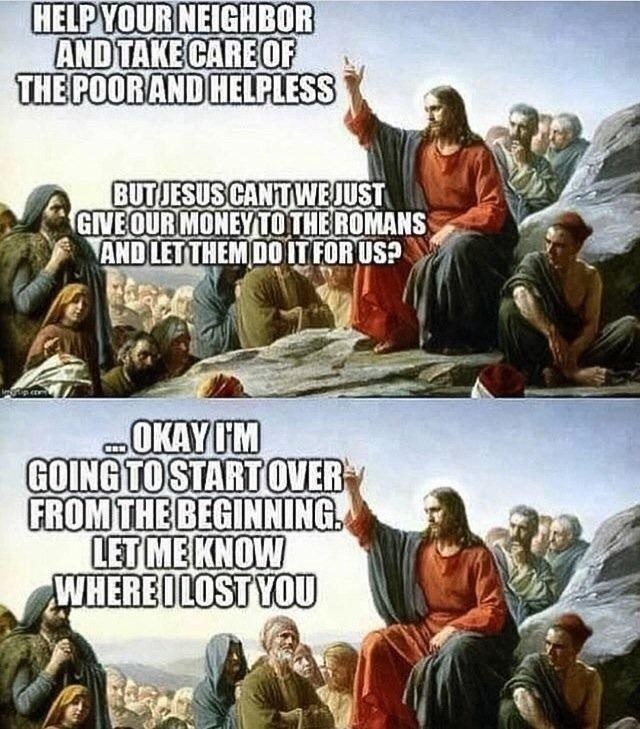 Libertarian Jesus made his first appearance back in 2013, when he cautioned that charity was a personal obligation rather than a government responsibility. He had an encore performance last year, when it was revealed that charity and confiscation are not the same thing. Now we have Part III, featuring Jesus trying to impart wisdom. P.S. President Trump disagrees with Jesus. P.P.S. This is why I’ve been critical of Pope Francis. His heart may be in the right place, but he’s misguided about the policies that actually help the less fortunate. For what it’s worth, it would be helpful if he was guided by the moral wisdom of Walter Williams rather than the destructive statism of Juan Peron. Pope Francis finds himself cast by his peers as the leader of the Church bracketed by the legacy of a Polish freedom fighter and a German theologian. His own life experience is pockmarked with teaching moments facing Argentine dictatorships, fascism, populism, economic mismanagement, bankruptcy, and Latin American Liberation theology. The legacy of Pope John Paul was largely promoting the values inherent in individual freedom, made politically and economically functional through religious freedom, democratic government, and market economics. That of Pope Benedict seems to have been the need to confront European history and the distortions of its heritage crafted by governments pursuing group loyalties, eschewing, by and large, fundamental values championed by the Church, that is, those based on the preservation of life, human dignity, and the discipline needed to respond to nature and the yearnings of individuals. Pope Francis’ response, being thrust into leadership of the Church, draws largely on his life’s experience, and less on Church history. The lodestar he has chosen is St. Francis, touching the need for a moral response to human needs. His expressed understanding and meaning in the teachings of Jesus Christ are heartwarming. The loyalty and affection given hm are a reflection of his interest in addressing the needs of the poor. However, Pope Francis, scientist, and economist, being human, make mistakes. On global warming, for example, is not settled science. Science never is, and secular programs based on its errors run the risk of being built on shifting sands. Historically, when the Church condemned Galileo and helioocentrism, it erred scientifically, as well as doctrinally. It may be repeating the error with respect to global warming. The actions proposed by climate zealots, believing in of the negative impact of warming, run the risk of being seriously misguided. Past directions undertaken by the secular world to address perceived problems have frequently been harmful to mankind, and the poor. The response to population growth, for example, once viewed as catastrophic, formed the rationalization for aggressive contraception programs and the legalization of abortion, essentially anti-human programs. It threw out the baby with the bathwater. That experience ought to be a warning to all, the Church included, of possibly traveling down a hellish road of good intentions. . Historically, St. Francis, among other things, undertook initially to rebuild a nearby church. and then, the entire Church organization. He chose to live simply, loving nature, and personally helping the needy. Pope Francis’ leadership also reflects his understanding and appreciation of Christ’s life and example. So far, so good, as guidance for the new Pope. However, being human, the Pope can make mistakes. Chance, and history would inform him that the world is a dangerous, unsettled, creation. He is being tempted to lead the Church as an active participant in secular political and economic directions. That may clash with an admonition, and guidance from Christ. Government was not Christ’s chosen field. Specifically, he advised his disciples, and his followers, to keep away from it, using the words, “Render unto Caesar the things that are Caesar’s, and unto God the things that are God’s.” And when he asked them to join him, his offer was for them to, “Come after me, and I shall make you to become fishers of men.” In these examples, Christ seemed to advise staying away from secular pursuits and challenging the power of rulers. Christ’s words seem directed more toward individuals and the common man, advising them to be true to their better nature. He seems to recommend distance, perhaps separation, from governance. Misinterpreted, he was crucified. In governance, the record, and experience of the Church has been, in one word, tragic. Framing and enforcing the law through secular rulers and institutions of government has not worked out well. In the biblical narrative of creation, the Devil, exercising his free will, chose to challenge the Almighty. For his ambitious attempt to be supreme, he was cast into Hell. Historically, the Church legitimized governments and instigated religious and secular wars. In the end, its secular actions resulted in its being corralled, and relegated, to the residue of its worldly empire – the Vatican. What it retained effortlessly, however, was its suasion over individual beliefs, and the life lessons of Christ. These were, and apparently continue to be, consistent with human experience and nature. Pope Francis ought to take heed of this history. Rushing in a direction where “angels fear to tread” while tempting, may not be best for the Church. The secular world is not easily tamed. It is a world fraught with material hazards, and conflicts over power. When the Church attempts to creatively work within it, it inevitably overreaches. Such attempts would best be left to the machinations of Caesars. Better for the Church to keep teaching its disciples to fish. It has its lasting effect on the individual, human nature, and, in the long run, may actually enhance mankind’s ability to achieve peace on earth. Your PS is wrong. If you look at Trump’s history there are many cases of him stepping in to personally help those who were done wrong by the government, or simply down and out. Unfortunately, most of those did not ever make the news. I think your other posts that you cite about him being a statist are being proved to be wrong every day.